While walking near my apartment, I stumbled across this really cool old-school Taiwanese “babu”* ice cream shop, He Mei Ice Treat House. He Mei is over 60 years old; originally established in 1948, the shop oozes vintage flavour. 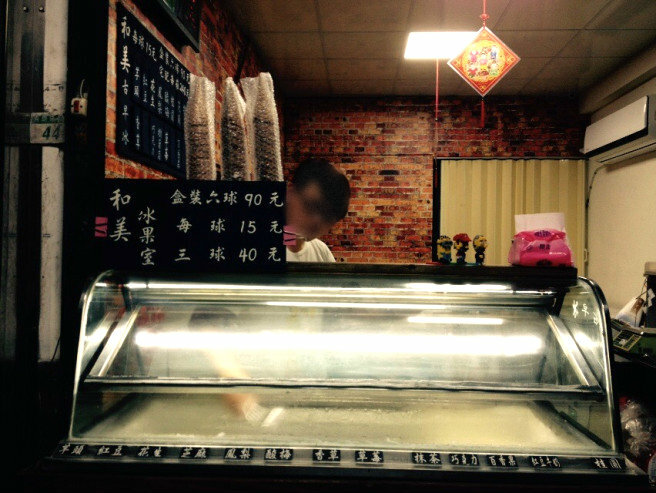 Along with ice cream, He Mei also sells house-made biscuits and other traditional Taiwanese snacks. It’s delicious and cheap, and it’s only five minutes from my house – I feel so lucky! 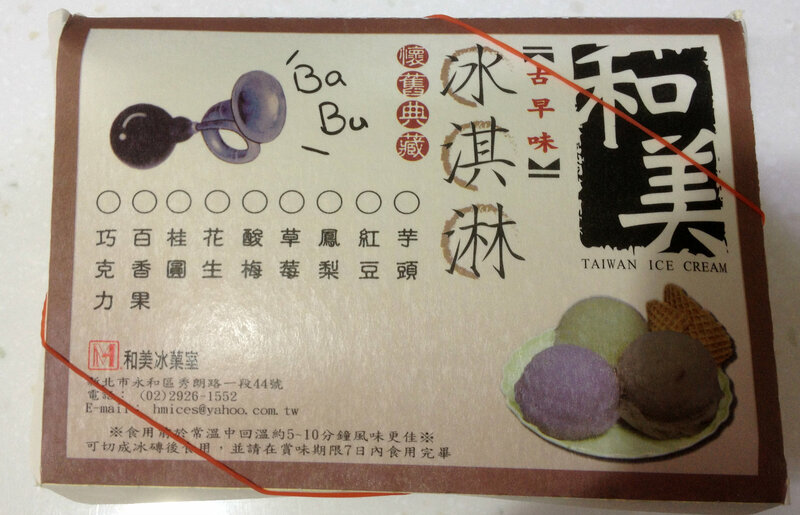 “Babu” is the name given to the type of Taiwan-style ice cream traditionally sold from bike carts. The “ba-boo! Ba-boo!” of the vendor’s bike horn became synonymous with ice cream – pretty much the Taiwanese equivalent of the ice cream truck song! He Mei’s ice cream is very affordable – one scoop is just NT $15, three scoops for NT $40, a box of six scoops for NT $90, and even a home delivery order for just NT $240. He Mei’s old-fashioned Taiwan-style ice cream. 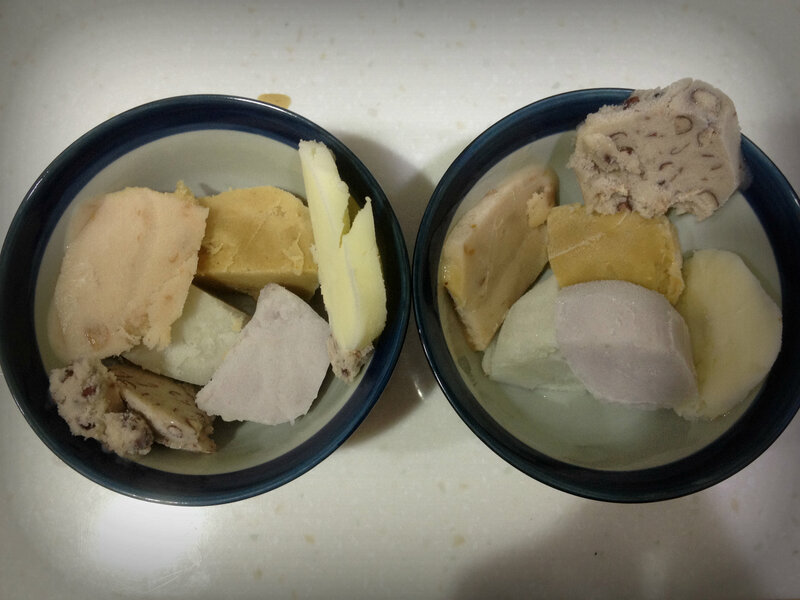 Clockwise from top left: taro, red bean, peanut, pineapple, sour plum, dried longan, black sesame, matcha, red bean with milk, sweet potato, passionfruit, strawberry, Brazilian grape, chocolate and vanilla. He Mei’s flavours all seem quite traditional, but to me they’re really fresh and new. There are several I’ve never tried before. I ordered dried longan flavour. Taiwanese readers may feel that this is a very common flavour, but as a foreigner, I’ve never tasted anything quite like it – I think it’s really special! Dried longans are cured over a fire, so they have a bit of a smoky taste. Western cuisine seldom pairs smoky flavours with sweets – nearly all smoked foods are savoury. But recently smoky-tasting sweets have become trendy in Canada and America – things like maple bacon, bacon-flavoured cupcakes, chocolate with smoked sea salt, etc. I think if smoky longan ice cream were brought to the West, it would be very popular! The dried longan flavour is complex, with a roasted fruit flavour rather than a simple fresh fruit flavour. It has a caramel-like sweetness along with the smoky taste and the natural tartness of fruit. It has a rich, creamy mouthfeel, textured with soft little bits of dried longan. My friend ordered pineapple and taro. You can see that they don’t use artificial colourings – the colours are very faint. Because He Mei is so close to my house, I took the opportunity to buy a take-out box to bring home so I could try a few more flavours – no need to worry about it melting on the way. He Mei’s takeout boxes are common bento boxes. My filled takeout box looked like an ice cream bento – so cute! I invited a born-and-raised Taiwanese friend to join me for a hearty ice cream meal and provide a local’s perspective on Taiwan’s local ice cream. Pineapple: Staff recommendation. Low-fat and Low-sugar with a sweet-tart pineapple flavour, not milky-tasting at all – more like sorbet than ice cream. It’s quite light and refreshing, not too strong – perfect for summer. Guava: Awesome! Rich with the musky sweetness of guava and a smooth, creamy texture. My friend and I both loved it and highly recommend it! This was my friend’s favourite. Peanut: Rich and peanutty, a little on the sweet side, with a thick, creamy texture. It differs from French-style peanut ice cream in that it’s purely peanut-based without the added flavour of milk, and its texture is thicker and more robust due to the addition of thickeners. Although I personally prefer the French style, both styles are delicious. As for traditional Taiwanese-style ice cream, I think He Mei’s peanut ice cream is tastier than others I’ve tried, including the top-selling peanut ice cream at Taipei’s famous Snow King ice cream shop, with a richer peanut flavour. Taro: Although taro is one of He Mei’s most popular flavours, my friend and I both found it a little underwhelming. There’s nothing wrong with it, it’s just a little bland and lacks character. 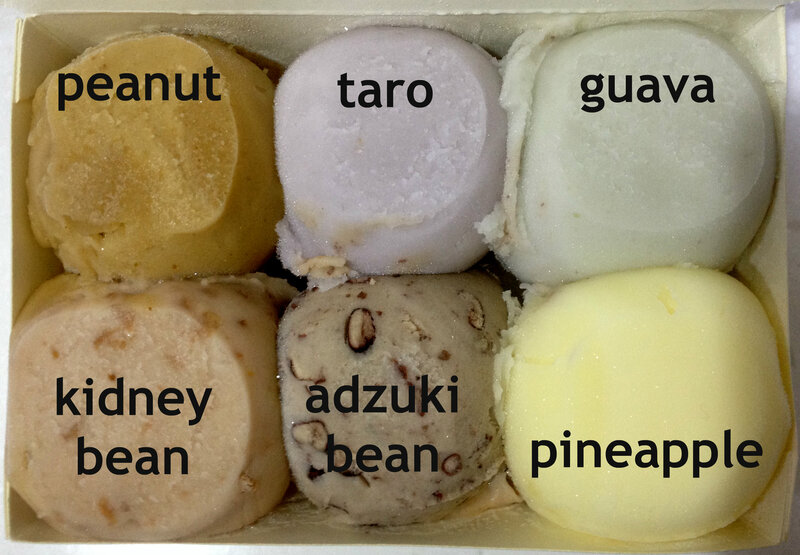 Adzuki bean: This ice cream is full of beans! Fresh, whole adzuki beans, that is. It seems quite wholesome. The flavour is natural and delicious and not too sweet – it tastes almost healthy. Kidney bean: Awesome! This was my favourite. The natural flavour and texture of kidney beans is satisfying and delicious. Kidney beans differ from adzuki beans in their special, slightly smoky flavour. Kidney bean ice cream may sound bizarre to foreigners, because western cooking only uses kidney beans in savoury main dishes such as chili, but kidney-bean-ice-cream-fearing foreigners, trust me – it’s actually really delicious! Although this ice cream is too sweet to eat in large portions, it’s still very good and full of flavour.